Do you want to entertain your friends or colleagues in a fun and original way? Then add the Balloon Bomb Squad game to your gathering! You will be the talk of the town with this fabulous game introduced to your event. From birthdays, bar mitzvahs, weddings, or even to liven up a Saturday afternoon - the addition of the Balloon Bomb Squad game with MJ Castles will bring excitement to any event. Entertain kids and adults alike with the Balloon Bomb Squad game added to your garden game list now! This inclusion to your event will bring a uniqueness that will be hard to forget! Your guests will have memories no one else can duplicate for the rest of their lives. The Balloon Bomb Squad game is fun for those playing and watching! As it is a duel game, only two people can play at a time while everyone else watches. Included in the package contents are two pumps that look like authentic TNT boom blasters! The two competing will use the pumps to blow up a balloon until its container causes it to explode like a bomb. The person who pops their balloon first is the winner. Onlookers get the joy of watching those playing struggle to pump the boom blaster faster than their opponent to obtain the win bragging rights. Even if you don't want to play, cheer on your friends or co-workers as they fight to see who can pop the balloon! To hire this unique inflatable game, all you need is £80 and an ideal space of 10ft by 12ft. The rest is up to us! We make sure that the game is not only delivered to your home or event, we pick it up, too! Point us to where you want the amazing Balloon Bomb Squad game and we will set it up for you then take it apart when you're finished. All you need to worry about is enjoying yourself while your companions create fond memories with the game you hired! There is no chance of injury or boredom as we have ensured that this game is 100% safe for anyone that wants to join in the festivities. 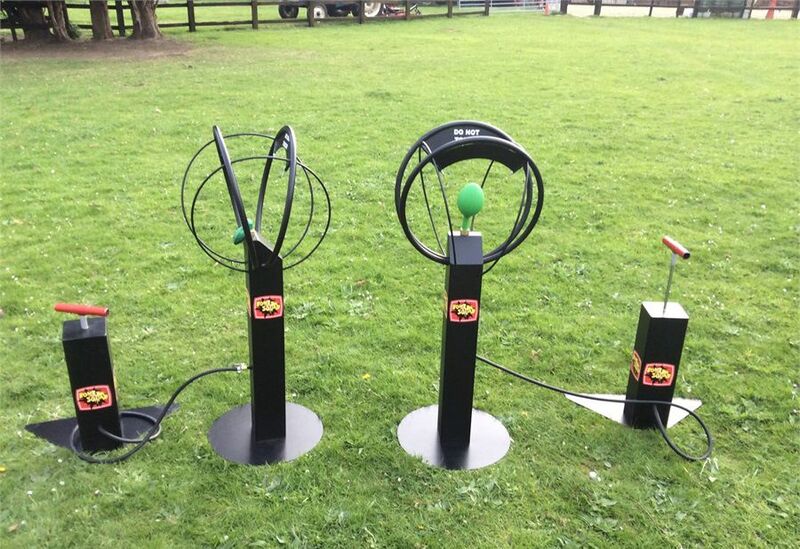 Great for indoor or outdoor activities, this game is suitable for all ages and doesn't require power! Liven up your event with this amazing and competitive game! Great for entertainment or team building exercises for corporate retreats. How Do I Hire One?! You can get the Balloon Bomb Squad game individually or with other bouncy castles to create your own playground easily! We are more than happy to hear any questions or concerns that you may have. There are many ways to contact us and book your Balloon Bomb Squad game. For your convenience, they are either use our online contact form, or email us at info@mjcastles.co.uk. Contact MJ Castles to hire your very own Balloon Bomb Squad Game today and bring your event to the next level of fun!